Welcome to Asbury United Methodist Church of Arnold, Maryland, a dynamic congregation that has served Christ since its establishment in 1859 ---- active participants in community life on the Broadneck Peninsula of Maryland for more than 150 years. We believe that the Bible reveals God's truth, guides us, and defines our Christian walk, and we desire to share the Good News of Jesus Christ with the world. Asbury offers varied opportunities for people of all ages to live out the message of the Gospel, to learn, and to grow as Christians. Because God's love is reflected in both our outward service and our inward faith, we encourage members to volunteer their time and talent and give of their financial resources for ministry. As stewards of God's creation, we seek to improve our community, nation and world. According to records held at the Lovely Lane Museum in Baltimore, Maryland, our congregation was part of the Severn Circuit as early as 1831. People gathered in someone's home or a public meeting place, perhaps the Quaker Meeting House that was located near what is now called Amberly. Thomas Hamilton Arnold, a fifth generation Maryland settler, was a prosperous young farmer and storeowner who was a trustee of the fledgling church. He lived very near to where Asbury United Methodist Church now stands. His modest brown shingled home may have been a meeting place, or a hospitable dwelling for the circuit-riding minister. Thomas and his wife, Rebecca, came up with a plan, "in consideration of their desire for the propagation of the Gospel," the Arnolds deeded one acre of land to the trustees of Asbury on December 26, 1859. The deed states, " . . . they shall erect and build, or cause to be erected and built thereon a house or place of worship for the use of the members of the Methodist Episcopal Church of the United States of America, according to the rules and discipline . . . ." It was agreed that the church should be plainly built. The design should provide two doors, thus the men and women could enter and be seated separately, similar to the Quaker tradition. The five trustees who signed the deed were neighbors with farms and homes nearby: John B. Nichols, John E. Pettibone, James Spriggs, John A. Hoye, and William Hammond. Other trustees who did not sign were John S. Stallings, Cyrus N. Joyce, Robert W. Waring, and Daniel Peregoy. We can document the existence of a building on the site by consulting the Martinet Tax District Map of 1860. The present church presently stands on the site marked Asbury Methodist Chapel. It is said that the first chapel built on the site was constructed of hand-sawn planks. 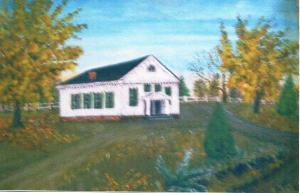 Our church is fortunate to own three paintings by Masonetta Stinchcomb Waring, one of which depicts the original building. On the back of the painting she has written, "My older brother, Robt. 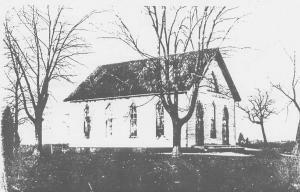 A. Stinchcomb recalled this church to be exactly like the old church at Baldwin Memorial. From that I painted this." The first building erected in 1859-1860 was razed, and a new edifice built on the foundation in 1888. In 2007, after several years of dreaming and planning major parking expansion and site improvements were begun. From the initial design stage, the Historic Sanctuary was to be the primary image one sees as passing by. It is the high point of the property and although future plans call for a larger sanctuary, the Historic Sanctuary with its red doors will always stand tall in the hearts and spirits of those who have worshiped God and launched their discipleship of Jesus Christ from this place. When you enter the swinging doors into the sanctuary, you are standing with the spirits of Asbury parishioners who have worshiped here since 1888. The structure which forms the nave of the historic sanctuary was built in 1888. The contractor was Alfred Asbury Stinchcomb, a local builder and member of the congregation. An invoice in the church archives indicates that the tin roofing for the building, bought from James H. League, Maryland Stove House, 113 Main Street, Annapolis, Maryland cost $129.97. This price also included "R.R. passage for hands and freight on material." There were two doors on the front of the building facing Church Road, one for men and one for women. In 1914, a 20-foot wing was added for classrooms. The orientation of seating was rotated 90°, and a bump out was added to house the cancel area. The bell tower with narthex at the base was added and a basement was hand dug. The paneled wall of the current hallway became the back of the sanctuary, and was engineered so that it could slide up into the attic to make overflow seating space. Two separate doors were on two sides of the bell tower, and the original two doors became windows. 1950 brought another major renovation when a new 20-foot addition was added to accommodate the altar, organ, and choir seating. The seating orientation changed 90° again, and some of the pews were cut and pieced to fit the new arrangement. If you look carefully, you can find 9 of those pews. Six new pews and a matching communion rail were purchased. Two stained glass memorial windows were installed. "Jesus in Gesthemane" was donated by the Botzler family in memory of their son killed in World War II. "The Good Shepherd" in the rear, was donated by the Dull sisters in memory of their mother who was the first president of Asbury's United Methodist Women. The pulpit and lectern paneling were built by Bill Neilson. The balcony in the rear was also added. During this construction period, the congregation met in the Arnold Fire Hall. The altar cross was made by T. Roland B. Riley in 1937. In the 1980's, vandals came into the church, stole the cross, flower vases, and candlesticks. They also sprayed CO2 fire extinguisher around the Asbury Room and turned on the gas stove before they left by the rear entrance. Fortunately, they left the door open, or we may have lost the building at that time. More than a year later, the cross was returned by a quick-thinking detective as the police department was disposing of unclaimed items. The lower level of the building houses the Asbury Room, classrooms, library, choir room, Boy Scout equipment room, two rest rooms and a furnace room. In days gone by, women of the church served suppers in the Asbury Room. The three paintings hanging on the wall are by Masonetta Stinchcomb Waring. In 2003, the historic sanctuary was completely renovated while the congregation met in Fellowship Hall. The building, both upstairs and downstairs, now in pristine condition, stands ready to welcome any and all worshipers. The sanctuary itself is always open; in fact you will notice as you go out, there is no lock on the outside red doors.